Words can hurt. In Vinay Patel’s sharp, smart satire about our culture’s increasing vigilance when it comes to matters of language, B uses a word as part of a misfiring joke to which her colleagues take offence. It didn’t offend them personally, they explain, but it can be offensive to some people and therefore they deem it offensive. The situation rapidly escalates. B undergoes intense sensitivity training. Her job comes under threat. People with extremist views leap to her defence. We never hear the word in question. It’s left to our imagination. In its place there is a flashing light and a hand gesture. This use of gesture to underscore or replace certain words continues throughout the piece. Choreographed by Jennifer Jackson and Simon Carroll-Jones, the play starts to morph into dance-theatre. The performers pull faces, contort their bodies and manipulate their limbs. They spend a lot of time on the floor. It looks exhausting. It’s supposed to. 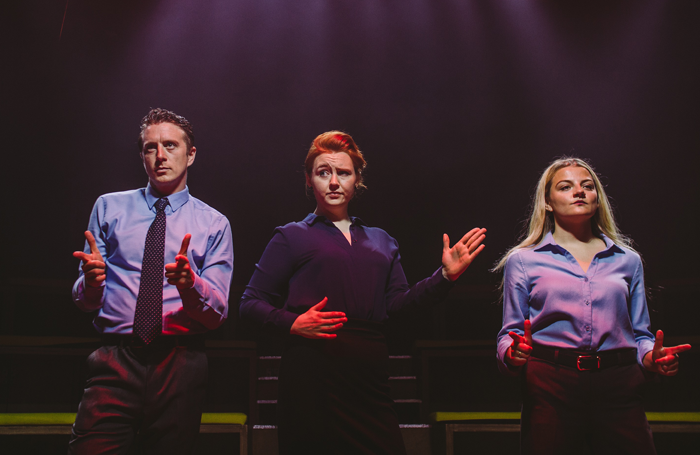 Katherine Pearce, as B, and Charlotte O’Leary and Jack Wilkinson, as the various colleagues and HR bods that B encounters, give highly physical performances. Director Stef O’Driscoll works them hard but sometimes this obscures the incisiveness of Patel’s play. It’s a fluid piece of writing that explores the subject from numerous angles and asks numerous questions, while entertainingly skewering corporate jargon and shifting sensitivities.